After configuring your network router, let’s start to configure computer / notebook that installed with Windows XP. 1) Click Start and click Control Panel. 2) Control Panel window will appear, then double click Add Hardware icon. Simply follow step-by-step instructions prompted by system for adding card driver. Kindly check your network card driver status to confirm it’s installed properly. When you configure computer, you will also need to configure network card for your computer to communicate with other computer or network devices. This communication method is called protocol. You will need to have TCP/IP protocol and other Windows items installed on your computer in order to make it work correctly. 3) Network Connections window will appear. Right click correct Local Area Connection by identifying correct network card and click Properties. 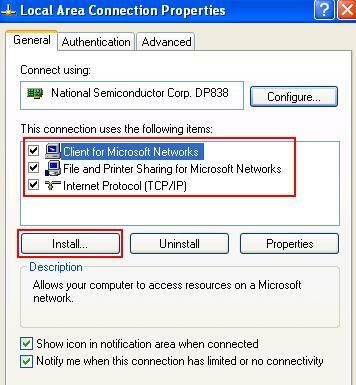 Client for Microsoft Networks – Allows your computer to access resources in a Microsoft network. File and Printer Sharing for Microsoft Networks – Allows your computer to share files and printers in Microsoft network. Internet Protocol (TCP/IP) – The protocol that enables your computer to talk to other computers in your network. You need to specify IP address, netmask, gateway and other network information for it to work. Assign the IP address following your IP network design, and make sure the IP is unique. If you don’t have those specified items installed, click Install… and follow instructions to install the items which you missed. Each computer in your network must have a name and assigned to a workgroup, so that it’s easy for you to identify the computers in your network. Follow step-by-step instructions here to set computer name and workgroup when you configure computer. So, this is the way you can use to configure computer in your network. After that, you can proceed to do file sharing or printer sharing in the network. If you have network connectivity problem, check out how to use ping to troubleshoot the problem. At this stage, basically your network is up and working.